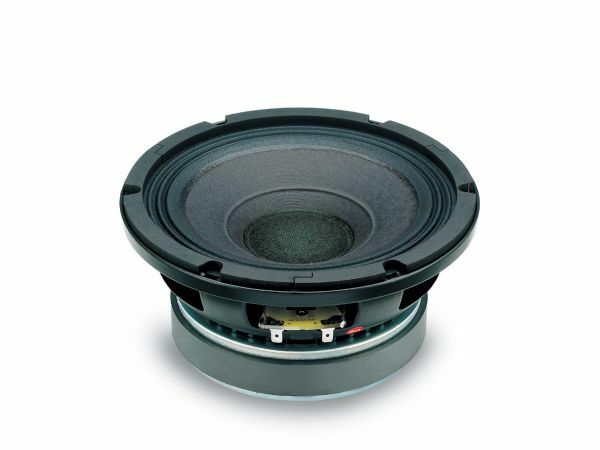 Produktinformationen "18s 8M400 8 Ohm"
The 8M400 is a high power, high output, 200 mm (8 in) midrange for high level professional use. The excellent sound quality has been achieved as a result of extensive research on mid frequencies intelligibility. The 8M400 has been designed for use as a midrange in both horn and direct radiation, closer or reflex enclosures, as small as 3 lt. The curvilinear cone, made with a high damping wood pulp, has been designed to achieve the best possible linearity within its frequency range. The in-house developed cone treatment is a humidity repellent and also dampens the bell mode resonance significantly. The 51 mm (2 in) ISV aluminum voice coil assembly is wound on a strong fiberglas former to improve force transmission and power handling. ISV technology is based on a high strength fiberglas former with half the coil wound on the outside and half on the inside and bonded together using unique high temperature resin adhesives. The powerful magnet assembly assures high flux concentration. The force factor and power handling are at an optimum level. The direct contact between the finned basket and the magnetic structure significantly improves thermal connection and heat dissipation, further increasing power handling and lowering power compression. The copper shorting ring on the pole piece reduces inductance and improves transient response and phase control in the mid frequencies. Weiterführende Links zu "18s 8M400 8 Ohm"
Kundenbewertungen für "18s 8M400 8 Ohm"